Tenha uma visão geral abrangente de Helsinqui durante esta excursão a pé de 2,5 horas. Visite locais de interesse e destaques, como o Museu de Arte Contemporânea Kiasma, a Uspenski Russian Cathedral, a Chapel of Silence, o Esplanadi e outros. Seu guia falará sobre a história e a vida moderna dos dias de hoje na cidade de Helsinqui enquanto você caminha. Siga seu caminho até a Sentatea Square no centro de Helsinqui para encontrar o seu guia e grupo e, então, você começará sua excursão a pé de 2,5 horas. Aventure-se pelo coração histórico de Helsinqui, onde você fará uma parada nos importantes locais de interesse, como Uspenski Russian Cathedral, Museu de Arte Contemporânea Kiasma, Kamppi Center e Chapel of Silence, dentre outros. Saiba mais sobre a história finlandesa e como é a vida na Helsinqui moderna pelos comentários informativos do seu guia. Faça uma parada no mercado local para um lanche e um café (por conta do visitante) e, depois, continue até a Temppeliaukio Church, onde sua excursão termina. everything was nice! 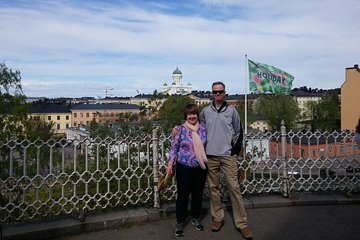 highly experienced and friendly guide Florian who took us to so many nice places and showed major landmarks in Helsinki. it is a small group activity and we really enjoyed going around having a chat with him and other guests. he gave couple of good advises and tips where to buy real souvenirs and to eat. Fantastic tour with our guide Maria. Great if its your first time in the city, you will get a better understaning of Finland's history and cultural, plus you will get to know the layout of the city. Definitely put this on you to do list. Fantastic tour thanks to Maria who was funny, very knowledgeable and shared a lot of tips. We arrived early at our meeting point and it wasn't long before our guide arrived wearing her funny hat,making her easy to recognise. The tour started off at Senate square and finished at the rock church, with many interesting places in between. Catherine was great. Would recommend this trip. Our guide was excellent. He was funny, pleasant, and very knowledgeable. He gave us a lot of good historical information about Helsinki, Finland, and the Finnish language. The directions to the meeting location were very good, and his funny hat made him easy to spot at the busy meeting place. The tour was a good mix of interesting information, visits to scenic locations, and time for a break and to get something to eat at the local market.